The historic landscape area of Pwlldu Head encompasses the coastal edge, steep cliff slope as well as the open cliff top between mean low water and the extent of unenclosed land along the cliffs from Shire Combe to Caswell Bay, taking in area of Pwlldu, the southern extent of the Bishopston Valley, with its settlement and impressive shingle bank, where it meets the sea. A number of caves exist in the cliff face along this stretch of coast; some of these have provided evidence of habitation and even ritual activity dating back to the Palaeolithic. The most well-known are Bacon Hole Cave (00306w; 305582), and Minchin (Mitchen) Hole (00304w; 305580). Bacon Hole Cave was initially thought to contain prehistoric art, though this was later disproved, however excavations in 1850 by Colonel Wood revealed large numbers of animal bones dating to the Pleistocene era, such as Narrow-nosed Rhinoceros and straight tusked elephant. Archaeological deposits were also discovered and comprised a thin dark layer with pottery assemblages indicating occupation/use from the early Iron Age to the medieval period. Minchen Hole, the largest of the Gower bone caves, was initially excavated in the nineteenth century by Colonel Wood of Stouthall. Excavations under the direction of Mason and Rutter between 1946 and 1959 recorded hearths of the Romano-British and early medieval periods. Raised beach deposits of Pleistocene date with associated animal bones were also investigated. The earliest human material identified was from the early Iron Age. Of particular note were a series of bronze brooches ranging in date from third century to the eigth century, 16 coins of Roman date and three coins of ninth century date. Other caves include Bosco's Den, Bowen's Parlour, Caswell Bay Bone Cave, Crows Hole Cave, Spurge Hole Cave, Foxhole Cave and the east and west cliff caves at Pennard, many of which appear to have contained Pleistocene remains. Excavations at Bosco's Den or Bacon's Eye (00305w and 04688w) from about 1850 uncovered a number of animal remains including over 1000 shed deer antlers; these have been interpreted as indicating an Ivory working site (Morris and Grenfell 1970, 4-5; Oldham 1986). The cliff tops of the area were the focus of settlement and defensive activity during the Iron Age; this is represented by the High Pennard Promontory Fort (00312w; 94532; SAM GM405) and the defended enclosure of Redley Cliff, or Caswell Cliff Camp (00313w; 305585). Excavations of the former site in 1939 by Audrey Williams revealed evidence of use during the Roman period, meagre finds in the late first and second century AD, similar to the fort in Bishopston Valley, with the suggestion the well defined inner core of the inner rampart may represent two phases of occupation. It has been conjectured elsewhere that sites of this type may have seen continued occupation into the early medieval period or at least were subject to reoccupation. Direct evidence of medieval activities in the area, apart from finds, is limited to drystone walling (00797w and 02281w), and a mound at Graves End, Pwlldu (02282w), though the cliff tops would probably have been used as common pasture during this period. The caves themselves may have been used by traders or smugglers although this is not proven. Possibly from the medieval period but certainly during the post-medieval period the cliff faces were utilized for quarrying; this is reported in Cromwell's survey of 1650. Numerous limekilns and quarries of nineteenth century date are scattered along the coastline it was during this period that use of lime as an agricultural fertilizer increased; this further augmented the practice of quarrying and lime-burning on the limestone plateau of Gower. Maritime associations are strong and smuggling was common place during the eighteenth and early nineteenth centuries; of the two secluded houses at Pwlldu, the Beaufort Inn, dating to the eighteenth century, is reputed to have had dealings with smugglers and the area is associated with the gang lead by the notorious William Arthur of Great Highway Farm, and his deputy John Griffiths of Little Highway during the latter part of the eighteenth century. Over nine shipwrecks have been identified mostly dating from the late nineteenth and early twentieth centuries although many more must have met the same fate over the years. The earliest identified so far was that of the Ceasar in 1760, an admiralty tender sailing with a cargo of press-ganged men en route from Bristol to Plymouth, wrecked off Pwlldu Head, somewhere between 68 and 97 people were said to have lost their lives; the bodies of drowned are said to lie buried at Graves End. 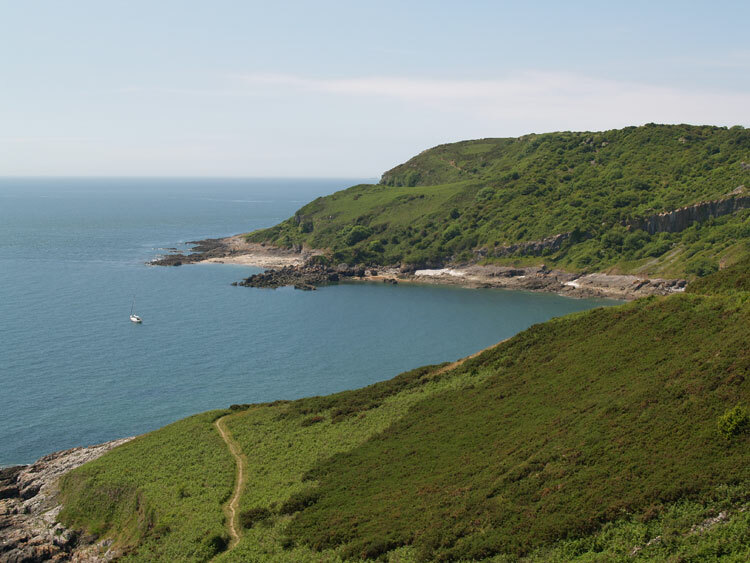 Like most of the Gower coast features relating to the Second World War to can be found in this area; these include Pwlldu Lookout Station (05396), marked by a solitary telegraph pole.